I landed in Nashville at midnight on a Monday and called a Lyft. As we got on the highway and I saw the skyline for the first time since December, I heard myself saying, God, I miss Nashville. I won't go into the details because they're not important, but let's just say after 24 hours in Nashville I didn't miss it at all. My journey across the country and back ended with my Mom picking me up in Murfreesboro and buying me breakfast at Chick-fil-A. I came home to some surprises- a peach tree lousy with green fruit, a mulberry tree even lousier, and and army of baby chipmunks who provide me and Pixel with endless entertainment. Clearing the mulberries off the patio is quite the chore, but I gotta do it or the white tile in my kitchen gets covered in deep, almost indigo colored stains. On that note: my dear friend Maggie Pate's first book comes out in June! It's called The Natural Colors Cookbook and it's all about using food waste to dye fabric. Next week we'll be using the mulberries I've been saving to dye a linen dress on the Porter Flea Stories. Follow along- there will also be cookies and kittens because that's how we roll. I'm still feeling very strongly that I mostly only want to sit in my backyard and drink trash water, but I have picked up a new hobby since my trip: eating strawberries in the bathtub almost every night. Tis the season, okay? Every now and then a couple of them will make it into or onto something and if it's going to be a something, it might as well be a cake. This one has a nice, soft crumb with a greenish tint from olive oil, a tiny bite from lime zest, and a sort of savory nature from creme fraiche and a large pinch of salt. It's good company for strawberries. You can opt to put the strawberries in it or on it or both- there's no wrong answer. And if you don't have creme fraiche (here's how to make it for cheap, btw), go ahead and sub in more ricotta. But you're gonna to want to have some creme fraiche or some unsweetened whipped cream for serving. 1. Preheat the oven to 350. Line the bottom a 9" pan with tall, straight sides with parchment paper and grease the sides. 2. In a medium bowl, mix sugar, flour, salt, baking powder and zest. In a small bowl, whisk together ricotta, eggs, creme fraiche and orange extract. 3. Add the wet mixture to the dry and whisk until mostly homogenous. 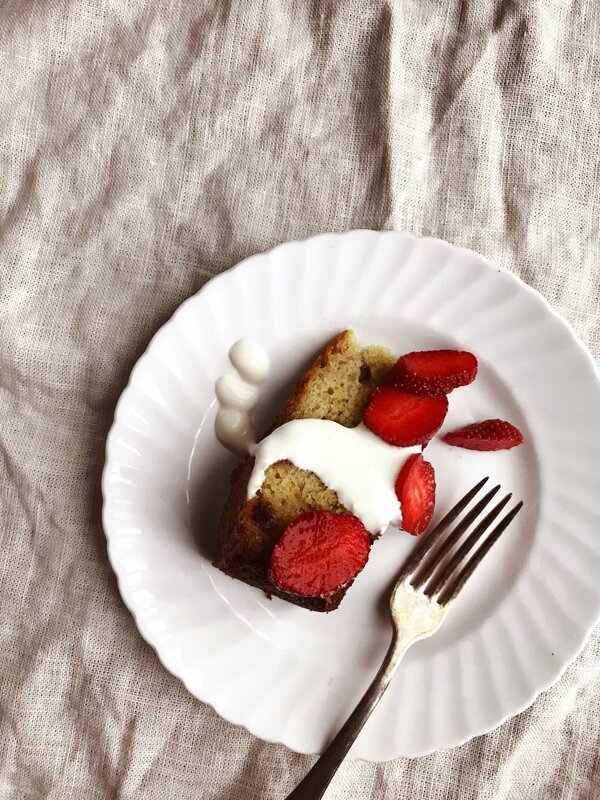 Switch to a spatula and fold in the olive oil, followed by 1 cup berries if you've decided to put them in the cake. 4. Pour the batter into the pan and sprinkle the top with the remaining berries and turbinado sugar. Bake 45-55 minutes, or until the top is golden brown and a cake tester comes out clean. 5. Serve with more creme fraiche and berries. If you put berries in the cake and have leftovers, wrap it up tight and store it in the fridge.